Today’s delivery drivers have a lot to think about while they’re on their rounds: multiple mobile devices, confusing paperwork, navigation systems and more. It needn’t be the case, however. Technologies like those provided by TouchStar can be used to bring everything together, reducing the risk of human error and boosting overall productivity. There are few better examples of this than the new TS3200 – a powerful mobile computer that packs all the functionality your drivers need into a single tablet-sized package. And, as feature-packed as it is, the unit’s biggest selling point – for many customers at least – is its hands-free integration. Let’s take a closer look at how it could benefit you. The TS3200 comes with a standard SIM card slot, meaning it can be used by the driver to make and take phone calls. This means there’s no need for additional mobile devices to be used in the fuel delivery truck, and no need for an additional SIM card and number. Convenience is undoubtedly the main benefit here, with drivers able to call contacts directly from the delivery screen. What’s more, these calls can be made safely while the driver is on the move, with Bluetooth hands-free pairing making communication both simple and secure. As is the case with most of our equipment, the hands-free compatible TS3200 mobile computer can be configured to your requirements – and its phone call capabilities offer a notable example. It’s possible to restrict the calls that are made from the device, to eliminate any timewasting or non-work-related communications. It could be that you upload a barred numbers list from the control centre application, or that you set the system up to allow only calls to customers on the delivery schedule. Once again, this helps to keep everything simple and your drivers on track at all times. 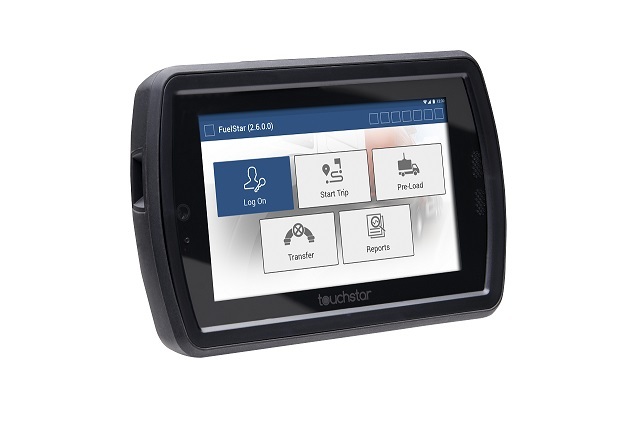 With its ultra-convenient hands-free capabilities, the TS3200 mobile computer is easy to set up and use, so you can be confident that your drivers are going about their days productively and effectively. The system can be paired, via Bluetooth, with most hands-free audio interfaces – and this process only has to be completed once. After a link is established for the first time, it’s simply a case of having the devices switched on and close by. This saves more time for your driver. Add to this the use of an innovative quick-release mechanism and a user-friendly interface, and your drivers are sure to take to it without any hassle. TouchStar’s various logistics technologies have been designed to boost productivity across your delivery business – in vehicles, warehouses and back at base. The TS3200 mobile computer is no exception. To find out more about the benefits on offer, and how a solution like this could change the way you do business, get in touch with the team today.